In the world of design, 'what goes around comes around' as they say. Houses are becoming filled with an assortment of vintage, antique and up-cycled furniture and furnishings. 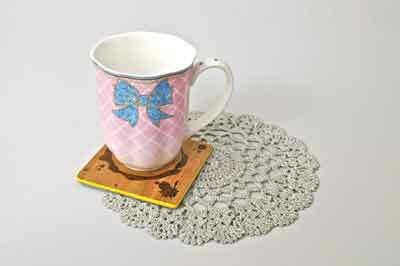 And the ethos of the cottage crafts industry is finally resurfacing with a desire to relearn traditional crafts. Using the age-old decorative art technique of marquetry, normally befitting sumptuous antique furniture, this coaster is a classy mix of the traditional with the contemporary, suitably stylish for any coffee table and fitting itself perfectly into our eclectic lifestyles. The first step is to cut the marquetry for this project. The background layer of the marquetry should ideally be a light coloured veneer and the detail/coffee spillage should be a dark veneer. 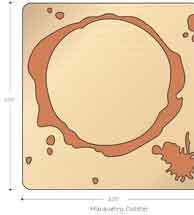 Starting with the background, cut-out the detail from the first paper template and overlay this on the light coloured veneer. Using a scalpel, start to cut out this negative space. 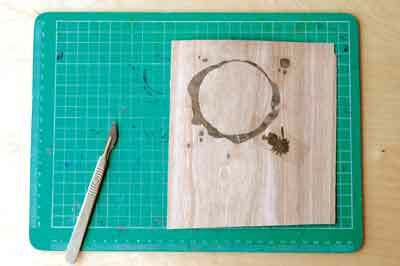 Once complete, place the dark veneer underneath and cut-out again but this time keeping the negative areas intact. Both types of veneer should then slot together, these can be held together with veneer tape on the back to stop pieces from going missing. 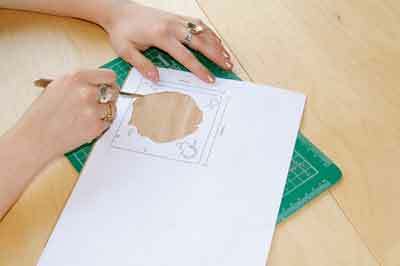 Using a paper template with the central hole of the background veneer cut-out, place this over the marquetry and cut-out from the dark veneer. Another piece of the light veneer can then be under-laid and cut-out to fit in the gap. 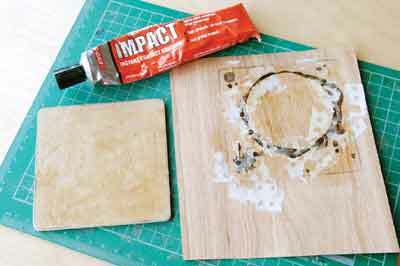 Make sure to match the direction of the grain in both separate pieces of the background veneer. 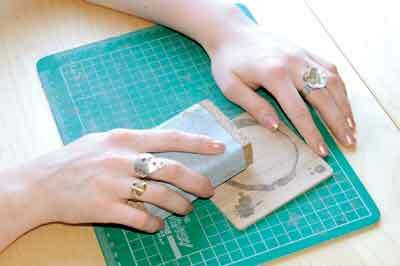 After the main 'spillage' has been cut out, you can then begin cutting out the smaller details using the same method. 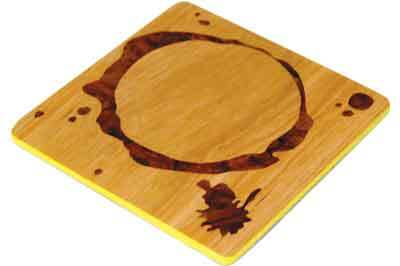 The groundwork is the base wood that makes up the core of the coaster and is what the marquetry is backed with to both keep it together and stop it from bowing. 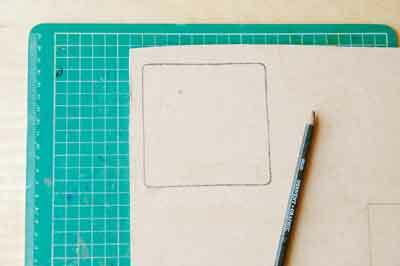 With the paper template, draw out the coaster shape onto either MDF or plywood and then cut out using whichever means preferred. If you do not have access to a bandsaw or coping saw, then a Stanley knife will cut through thin MDF, although breaking down the layers is a slow process. Next, smooth down the sides using a sanding block covered in sandpaper, working with a coarse grade and then a finer one. 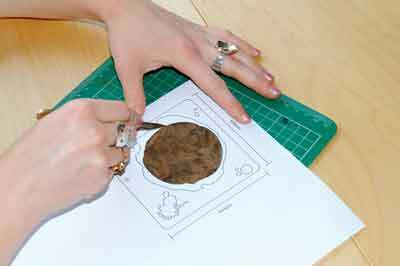 The marquetry should fit together like a tight jigsaw puzzle, which can then be placed straight onto the groundwork. 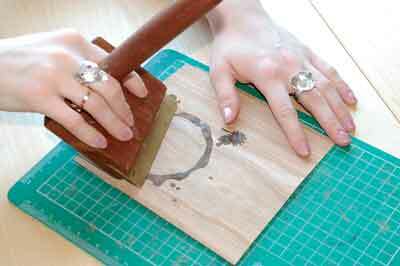 Using contact adhesive, apply a thin layer to the groundwork and to the back of the marquetry. 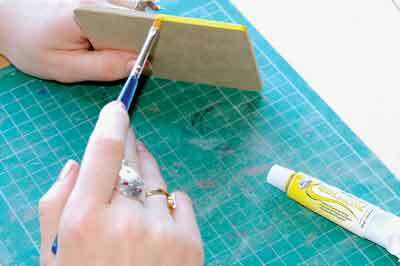 Leave the glue to go tacky then press both pieces together. 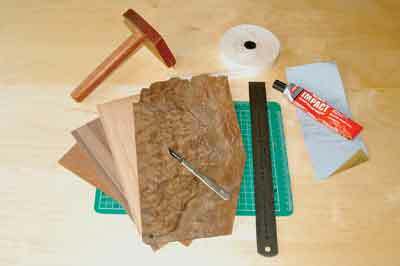 Rub over with a veneer hammer to flatten the marquetry down and remove any excess glue. 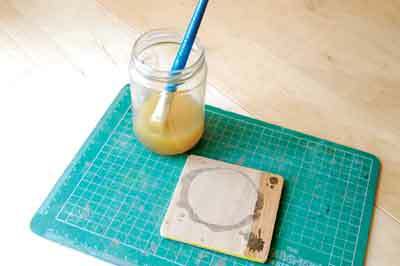 When the glue has dried, turn the coaster over and use a scalpel to cut away the excess veneer from the edges. 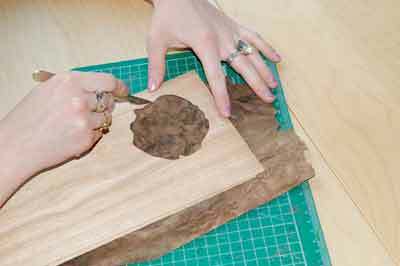 When the marquetry is complete the surface will not feel smooth, as the veneers may be different thicknesses. Sand down the surface using a block wrapped in sandpaper, making sure you are always following the grain to avoid scratching the surface unnecessarily. 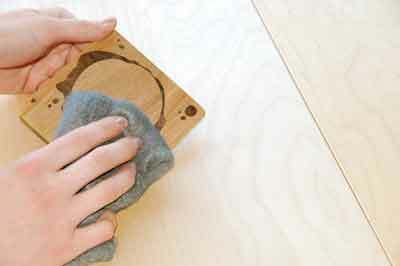 Start with a coarse grade of sandpaper and finish with a finer one. Choose a vibrant gouache colour to paint the sides, making sure that it is a complementary colour for the marquetry and the base fabric. 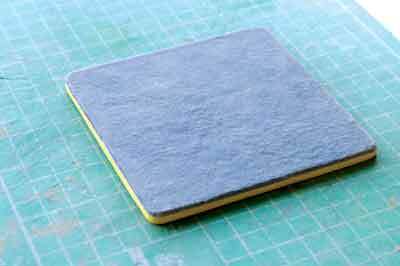 Paint the gouache onto the sides of the coaster at quite a thick consistency, avoiding getting any on the marquetry itself. It may take several coats of the paint to create a solid colour. 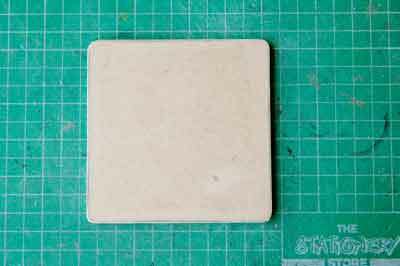 Having fabric on the base of the coaster will stop it from scratching any furniture surfaces that it may come into contact with. The fabric needs to complement the marquetry and paint choice as well as be durable enough to take a little wear-and-tear. 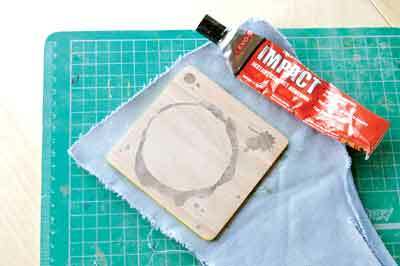 Using contact adhesive, apply a thin layer to both the back of the fabric and the back of the coaster groundwork. 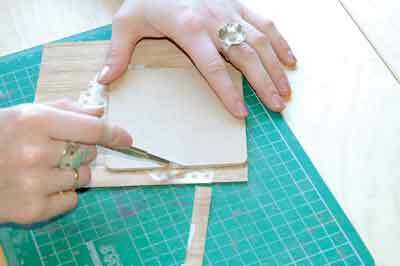 Once the glue has gone tacky, then join both sides together and press flat, making sure to remove any excess glue. Remove the spare fabric with a sharp scalpel. If the chosen fabric has a tendency to fray then apply a thin layer of clear nail varnish around the edges to hold the threads together. To create a glossy finish, use either a polishing mop or natural hair paintbrush to apply a solution of Super Fine White shellac and Isopropyl alcohol. Apply the solution in one direction and make sure to avoid drips or brush marks. Leave for a day to harden slightly then cut back lightly with fine wire wool. Repeat this process several times until you are happy with the gloss level. 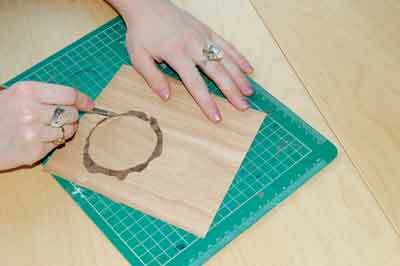 Once you're happy with the number of layers, apply a light coloured wax using a piece of cotton cloth. Leave the polish to harden for half an hour and buff up gently using a clean piece of cloth. 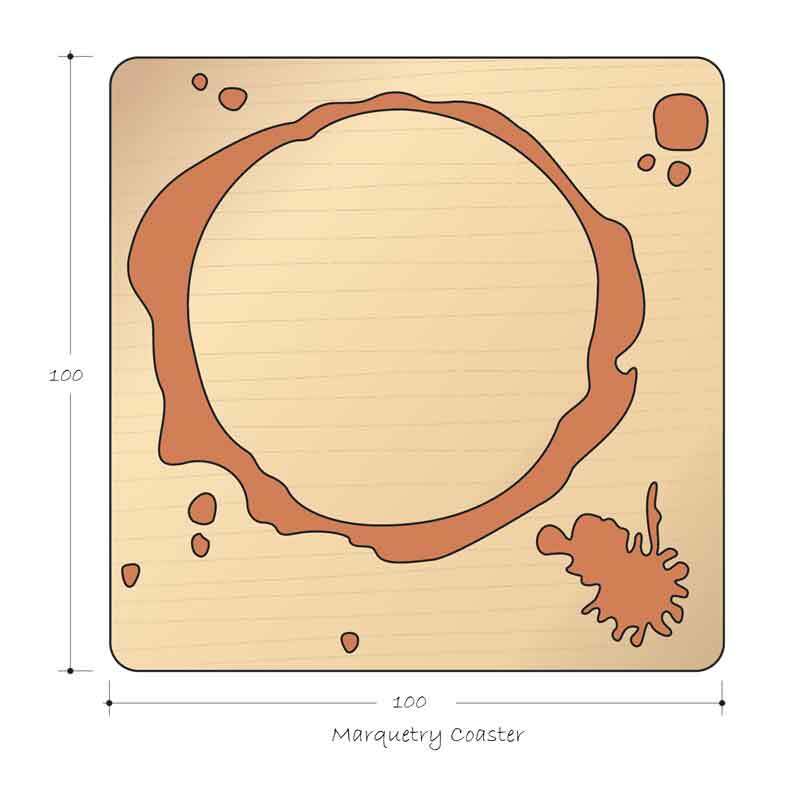 This should leave your coaster with a sleek and silky surface finish. A base fabric - velvet, baize, felt etc. 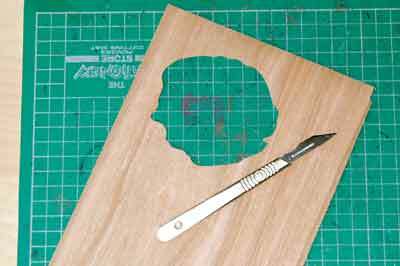 This project involves using a scalpel to cut the veneers. To avoid the blade slipping and causing any nasty accidents make sure to cut at an angle away from yourself. Contact adhesive is used in gluing up the marquetry and gives off strong fumes, so make sure to work in a place that is well ventilated.